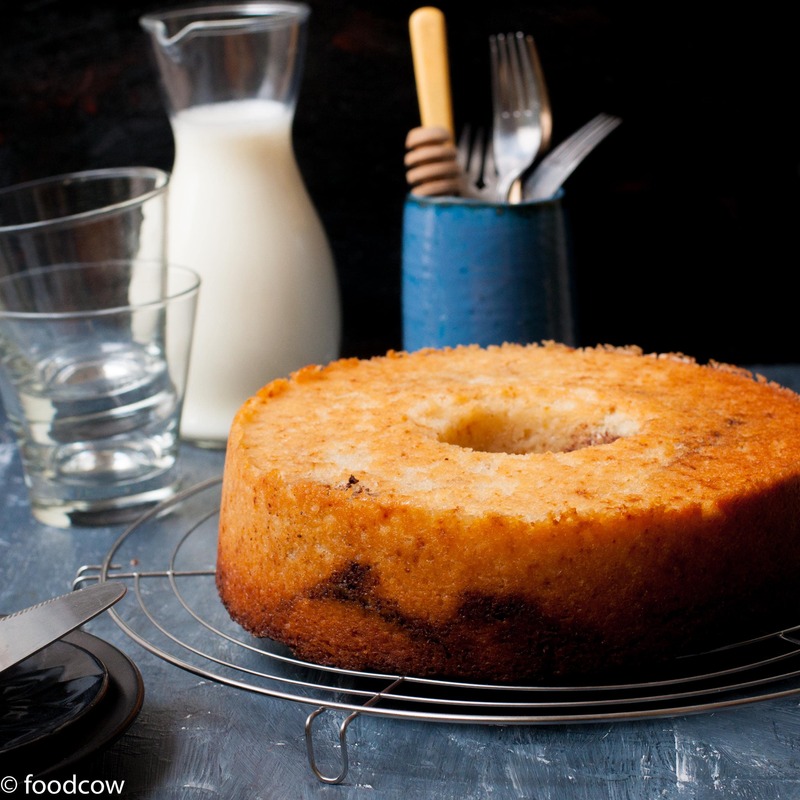 I love everything Cinnamon and this Eggless Cinnamon cake is the proof of that. The elegance of this cake is in the beautiful delicate swirls of cinnamon running through the middle. Very often, vegetarian eggless cakes are a pale version of the actual stuff.Usually- hard, tasteless, sometimes pasty, weirdly greasy and with a bad aftertaste because of all the artificial additives.This cake though is nothing of that sort.It has a beautiful crumb,a spongy airy texture and a taste that can easily rival most cakes with eggs. Isn’t there something so romantic about this cake? I could eat it at anytime of the day and in any form! In fact, Cinnamon Swirl Cake can be served while it’s still warm, right out of the oven(well almost) so you don’t have to wait for it to cool down but it is also great at room temperature or cold. Though, I have made this cake in a bundt pan but it can be easily made in a loaf or a cake pan.The baking time differs based on the size and shape of the cake pan and off course on the oven, so be on the alert from 25 minutes onwards.Also ,If you are a new baker, my article – Baking for Beginners-Bake your first Cake will be immensely helpful in understanding and acing baking. It’s a quick and easy to make vegetarian cake recipe- which pleases everyone!I have tried this recipe multiple times and it has never failed me. Note- While sprinkling the cinnamon sugar- remember that the cake will rise and the swirls will show in layers. Finally, If you love cinnamon like me – Do try my Homemade Easy Cinnamon Buns & Warm Apple Cinnamon Cake with Caramel Glaze recipes too! The BEST Eggless Cinnamon Cake - Perfect Vegetarian Coffee Cake with Swirls of Cinnamon Sugar.This recipe will make a 1/2 Kg Cake,Double the recipe for a cake as shown in the picture. Mix the Vinegar and Milk and set aside for 10 minutes. Mix the baking powder,soda and flour together. Combine all the wet ingredients-Yogurt,oil,vanilla extract, milk with vinegar and the sugar in a bowl. Take half the flour mixture and mix well with the wet ingredients. Once incorporated add the rest and mix together. In another small bowl, combine the cinnamon and brown sugar together. Pour 1/4th the batter in the prepared pan.Sprinkle 1 tsp of Cinnamon Sugar. Spoon in 1/4th the batter and again sprinkle 1 tsp of Cinnamon Sugar. Repeat the process till the batter is over.Sprinkle the remaining of the cinnamon sugar on top. Bake at 180 degree for 20 minutes uncovered.Cover with foil and continue baking for another 10 minutes.Test the cake with a skewer,If it comes out clean(or with crumbs) remove from the oven if not,keep baking for 5-8 minute more. Cool the cake and serve. Some more Eggless Cake recipes that you will love!